‘Het treinhuisje’ is one of Paul Driessen’s most beautiful films. This short builds on the surreal concept of a home built right on a railway track. The daily life of the couple living in the house is dominated by a train passing right through their home at certain times. With simple and direct storytelling Driessen sets the drama, in which this very train ruins the life of the couple. All the time we stick inside the couple’s home. Only when the man tells of his misfortunes, we shortly cut to the outside world. Ironically, it’s the railway itself that ruins the couple’s life. The story is told without dialogue, and supported by beautiful country music. The emotions of the couple are depicted well, and are very subtle. 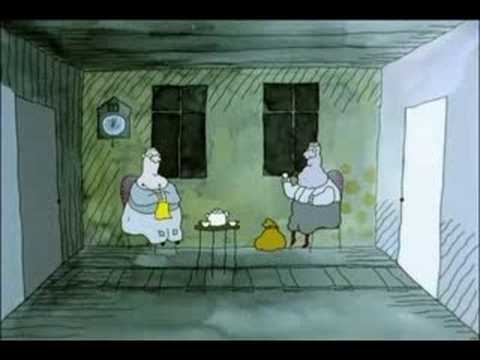 However, the film also shows Driessen’s typical animation style at its most radical: the film’s surrealism is enhanced by strange disappearances of the characters when they cross the room and by a ghostly avant-image of the train before it really enters the house. The film also shares the trademark morbid humor with other Driessen films, especially in the cuckoo clock and in the persistent fly bugging the characters throughout the picture. Nevertheless, the melancholy atmosphere dominates, and its the film’s drama that impresses the viewer time and time again.